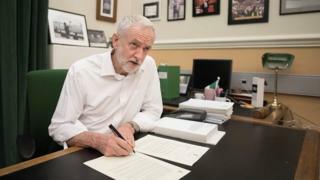 Home Latest News 2019 What’s behind Corbyn’s Brexit letter to May? Jeremy Corbyn has outlined Labour’s five demands for supporting a Brexit deal in a letter to the prime minister. But Labour MPs campaigning for another referendum are not happy and some are considering leaving the party. What’s missing from Jeremy Corbyn’s Brexit demands is as important as their content. While his office insists that his basis for a deal represents the “practical application” of Labour’s six tests, it is significant that there is no mention of this one: Does it deliver the “exact same benefits” as we currently have as members of the Single Market and Customs Union? This was a test which Labour believed could not be met and cheekily played back to the – then Brexit Secretary – David Davis, his own words. Its purpose was to give Labour cover to vote down any Conservative deal while “respecting” the result of the referendum. Its absence now is designed to signify that Labour is serious about a deal. On one level, it is astute politics. EU negotiators have signalled their willingness to have a “closer relationship” with the UK than the May deal would allow. And that they are willing to be more flexible if a proposal could command a solid majority in Parliament. Politically, the Labour leadership believe they have a “win, win, win” scenario. Win: They appear reasonable but Theresa May won’t play ball for fear of sacrificing her party’s unity on the altar of a customs union. She is potentially blamed by voters if Brexit goes badly. Win: Theresa May accepts their customs union proposal – and splits her party. Win: While pushing this option, any talk of a “public vote” is put off. It’s party policy to keep the referendum option on the table, but it’s teetering at the edge. But by expressing a willingness to do a Brexit deal, those Labour MPs campaigning for a ‘People’s Vote’ are expressing, at the very least, their dismay. And some are going further. 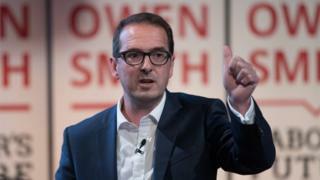 Former party leadership challenger Owen Smith – a strong supporter of EU membership who was sacked from the front bench for supporting another referendum – has told the BBC he is considering his future in the party. And a handful of others are considering when, or if, to resign the Labour whip. Some on the left of the party will say good riddance to people they see as “centrists” or “Blairites/Brownites”. 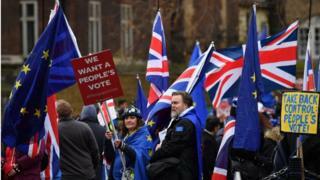 But the left-wing campaign group Another Europe Is Possible – led by a member of Momentum – is pushing emergency motions to Labour constituencies urging MPs to vote down any Brexit deal which Theresa May supports. Michael Chessum, from the group, told me recently that the morale of young pro-EU activists is waning because the party leadership has not been outspoken enough against Brexit and has suggested the whole Corbyn project – putting power in the hands of members – was in danger. That said, some non-Corbynista Labour MPs who back “Norway Plus” – single market participation and a customs union – have welcomed the leadership’s stance. As Labour’s offer to the prime minister is presented as a serious offer, its terms will come under increasing scrutiny. In particular, that as part of a customs union the UK would get a say over EU trade deals. That would, in effect, mean a non-member state would have more influence over the EU’s future trading relationships than any one member state currently has. Reality Check: What is Labour’s custom union policy? Labour supporters of the People’s Vote campaign regard this as the equivalent of a herd of unicorns and are pressing for Labour to put this forward as an amendment in next Thursday’s parliamentary votes – in the hope it’s defeated. The campaign itself has issued five questions on Labour’s letter, suggesting Brussels won’t buy it. One frontbencher – Matthew Pennycook – has suggested the party must move to support a referendum, if Labour’s new offer isn’t accepted. And his boss, Shadow Brexit Secretary Sir Keir Starmer, has had to reassure concerned Labour members that Thursday’s offer to the prime minister does not rule out the option of another referendum – and that Jeremy Corbyn will be writing another letter, spelling this out. So the Brexit Rule applies to Labour as well as to the government: Every Solution Brings A Problem. The #1 Link Indexing Tool which has the highest indexing rate in industry and help rank websites and videos in no time.